Ridgid has introduced the 238-P Powered Soil Pipe Cutter as a way to make cutting soil pipe easier in tight or hard to reach spaces where a typical soil pipe cutter would be difficult or impossible to use. Now, I am no expert in plumbing and plumbing specific tools, and I have only ever seen a soil pipe cutter used on home improvement shows like This Old House, but I can clearly see how a powered version can come in handy. 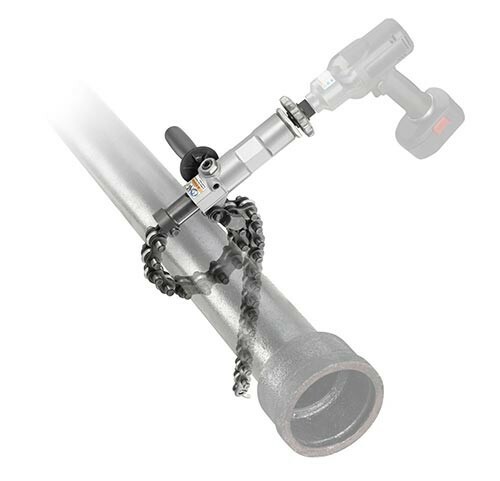 A typical soil pipe cutter uses a ratcheting type system that requires the operator to swing a lever back and forth to cinch up the chain that ultimately breaks the pipe. As you can imagine, the ratchet arm requires a fair amount of space to move. Ridgid's solution for the 238-P is to use the power of a ½-inch impact driver to cinch up the chain. This means that you need to own a ½-impact driver, but they are rather cheap these days. The 238-P is capable of handling cast iron and clay pipes up to 8-inches in diameter, and concrete pipe up to 6-inch in diameter. Other features of the 238-P include pipe scoring for cleaner cuts and a torque limiter to protect from overloading.